OnLive, the cloud gaming service, is making it easier to leave your laptop at home, but still bring along a Windows 7 desktop with you, on your iPad. The company has announced a new $5 per month plan called OnLive Desktop Plus that lets you access a virtual Windows 7 desktop on your iPad with Microsoft Excel, PowerPoint, and Word, Adobe Reader, and Internet Explorer (including Adobe Flash support). OnLive released a free version of its Windows 7 desktop for iPad in January, but without a Web browser. With the addition of IE, you now have what amounts to a fully functioning desktop on the iPad, at least for short trips when you just can't take a laptop. While the choice of IE as opposed to Firefox or Chrome may make some users cringe, the advantage here is you can use IE to access Adobe Flash content that would otherwise be unavailable on the iPad. You can also use Desktop Plus to access services such as Dropbox, Gmail, and Google Docs to access any cloud-based documents you may have while staying inside OnLive's Windows 7 environment. Both the free and $5 versions of OnLive Desktop come with 2GB of cloud storage. OnLive also plans on bringing a $10 per month plan called OnLive Desktop Pro that will include 50GB of cloud storage and the ability to add a select number of PC applications not included in OnLive Desktop Plus. I didn't get a chance to try out how IE performed on OnLive Desktop, but many critics are giving the experience positive reviews. "OnLive's version of IE is remarkably speedy, period," Harry McCracken said on Time. USA Today's Edward C. Baig said the browsing experience was "zippy." OnLive is using a 1 gigabit per second connection from its servers to deliver IE to your iPad's virtual desktop. In my brief hands-on time with OnLive, I found a lot to like. I appreciated having Windows 7's taskbar available for quick and easy app switching, and I felt the desktop was relatively responsive overall. 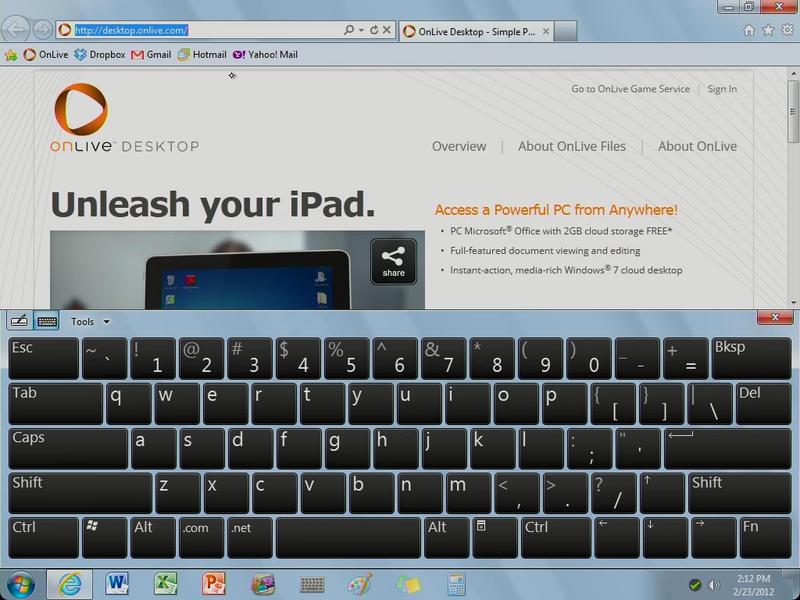 If you plan on using OnLive Desktop, I'd advise using a Bluetooth keyboard, as the Microsoft-designed Windows 7 virtual keyboard is slow and not as easy to use as Apple's native software keyboard. But even with a Bluetooth keyboard, fast typists may find it hard to deal with the delay between your typing and when the text shows up on the screen. To get started, download OnLive Desktop Plus from the App Store, and then sign-up for an OnLive account and your preferred plan through OnLive's site. You cannot sign up for OnLive through the iPad app. OnLive also warns that free users may not be able to get online to use the service at all times. 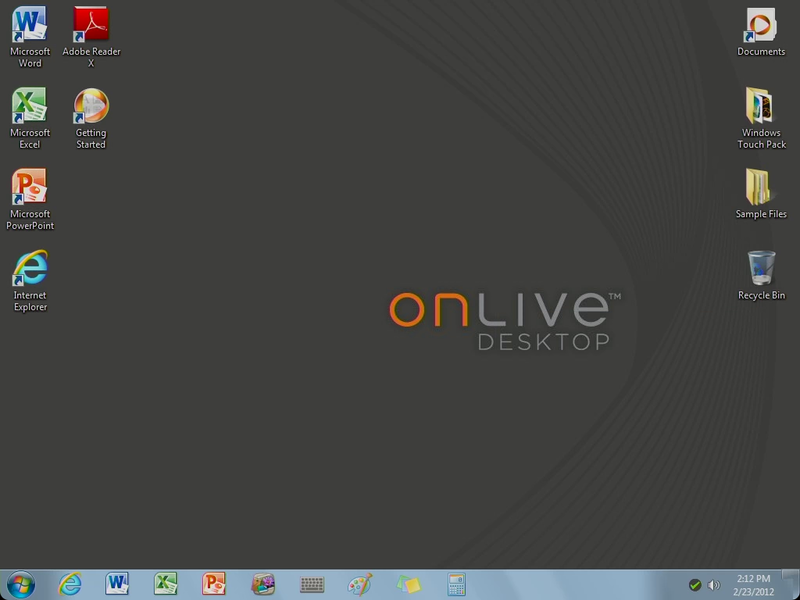 Desktop Plus and Pro users will be given priority during high traffic times for OnLive's servers. So if you plan on using OnLive for work, you may want to sign up for the Plus plan or the Pro deal when it becomes available.